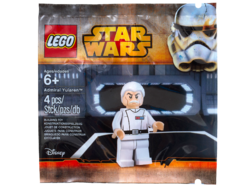 5002947 Admiral Yularen is a polybag which was released as a part of the 2015 "May the Fourth Be With You" promotion. The polybag contains four pieces to build a Yularen minifigure, two of which are exclusive to this set. Yularen has a plain white leg piece, and has a white torso with white arms and flesh-coloured hands. The torso features printing for an Imperial officer's tunic. On the front, this printing includes a black strip for the belt at the bottom of the piece for a belt. The belt also has a silver buckle in the centre with black outlining and detailing, and a single small silver circle to the left of the buckle. Also printed on the front are grey and dark grey creases, and outlining for the the front area of the tunic. This front area is outlined in black for the right-hand side and the top area, but the left-hand area is done in dark grey. Positioned on the left side of the chest is a rectangular silver rank insignia with black outlining. Inside the silver area are six rectangles in a row- three red followed by three blue, indicating the rank of colonel. The back of the torso piece also has creases, and a a plain black strip for the back of the belt. The main folds for the back area are outlined in grey, except for the neck area which is black. Yularen has a flesh-coloured head piece, featuring dark flesh printing for the cheekbones and chin, and for wrinkles under the eyes and between the eyebrows. Also printed are dark grey downturned eyebrows, black eyes with white pupils, and a white and grey moustache. Yularen comes with a white combed-back hairpiece. The same deal was later available between September 4 and September 5 (except for in the US and Canada) to celebrate "Force Friday", the day that The Force Awakens sets were officially revealed and made available for purchase. Wulff Yularen served the Republic as an admiral during the Clone Wars, working under Jedi General Anakin Skywalker and commanding his flagship, the Resolute. After the Republic was re-formed into the Galactic Empire, Yularen transferred to the Imperial Security Bureau and had a rank of colonel but was later promoted to the position of Deputy Director of Naval Intelligence. Yularen was killed aboard the Death Star when the battlestation was destroyed by the Rebel Alliance pilot Luke Skywalker. 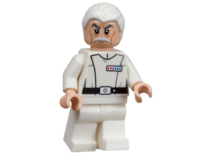 Although this polybag is called "Admiral Yularen", it is based on Yularen's appearance in Star Wars: Episode IV A New Hope where he holds the rank of Colonel in the Imperial Security Bureau. Yularen has a white leg piece, however like all other Imperial Security Bureau officers in Star Wars: Episode IV A New Hope, he wore black trousers in the film. This is a description taken from LEGO.com. Please do not modify it. (visit this item's product page) Give the order to attack with loyal Admiral Yularen! Command the might of the Empire against the Rebel Alliance with Admiral Yularen. This buildable 4-piece minifigure is a faithful reproduction of the Imperial officer as he appeared in Star Wars: Episode IV A New Hope. Facts about "5002947 Admiral Yularen"